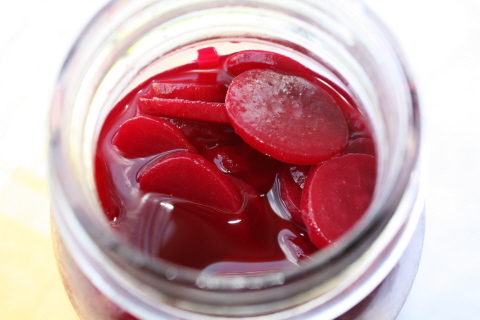 Pickled Beets – No Canning Necessary! Oh how I love the ruby colored gem of late summer. So beautiful and good for you too. There is no better way to savor them than pickling. Having no canning experience I opted for an incredibly simple method. They are sweet, flavorful and active prep is only about one hour. If you love beets you’re going to be hooked on these beauties! ½ cup honey – go local! Bring beets and enough water to cover to a boil over high heat. Reduce to medium and continue to boil for 45 minutes. With 5 minutes remaining on beets add onion slices. Drain beets and onions, reserving ½ cup of the liquid, set aside. While the beets and onions cool add beet liquid, vinegar, honey, salt, cinnamon, and cloves to medium sauce pan and bring to a boil. Peel beets (this should be easy once they are cooled), and slice. Add sliced beets and onions to a Mason jar, or air tight container of your choosing. Cover beets with boiled liquid, cover, and refrigerate at least 24 hours before eating. I prefer them after about 72 hours.